Each decal measures 7.5 inches tall by 5.5 inches wide. 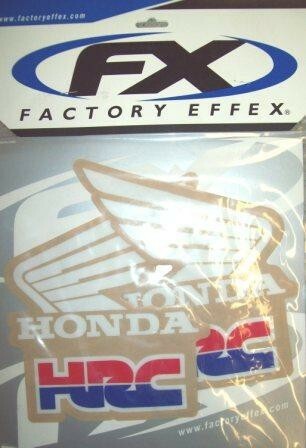 White Honda logo with a blue/red HRC print. Factory Effex is the industry leader in graphics. Printed on scratch resistant 16 mil. Ultracurve vinyl. All graphics are pre-cut for easy installation.